ALL Re-Entry passes will expire this year. Please see the following schedule for dates that Donnie Shumate will be in the office to issue new passes. This will be the only time he will be doing passes in office. If you miss these dates, you will be able to mail information in for renewal. Wednesday, May 9, 2018, 9:00am to 12:00pm and 1:30pm to 4:00pm; and Thursday, May 10, 2018, from 12:00pm to 3:30pm. Friday, May 18, with last names beginning with U-Z. 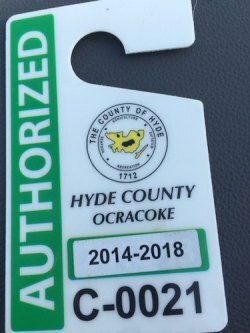 To make the process even easier, people with existing permits only need bring their existing hang tag, if you do not bring your hang tag you will need to complete the full application and supply all necessary documents. Those applying for the first time will need to complete the full application and supply all necessary documents.